You might notice that we haven’t really talked a lot about domestic violence (also called intimate partner violence.) We know it happens in lesbian relationships, just like it happens in heterosexual (and gay male) relationships. 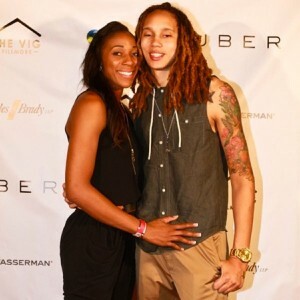 We’re not sports fans, especially, but even we have heard the story of Brittney Griner and her (now ex-) partner Glory Johnson. It’s hard to see someone who is a lesbian icon have trouble like this. Luckily, we only hear about it occasionally from our clients and students. According to research, it appears to happen somewhat less in lesbian relationships than in others. We do talk a lot about triggers — and domestic violence happens when people are triggered. But domestic violence is much more damaging than many other behaviors women exhibit when triggered (shouting, storming out, shutting down, etc.) The core issue in domestic violence is the same as the core issue in conflict in relationships that we talk about over and over again. One or both partners can’t tolerate their triggers — they haven’t learned to tolerate the strong feelings that arise. When triggered, we are all subject to what’s called the “Amygdala Hijack” which is when part the traffic to our conscious, cognitive, wiser mind is literally hijacked by our “reptilian brains.” Basically, we see our partner as a mortal threat. People who physically assault their partners are just taking that to a higher level than what happens in most relationships, but it’s the same exact process that underlies the kinds of ways women deal with conflict. The reasons that some women go to violence are varied, but it’s likely that they were exposed to violence growing up, so it is a mechanism that is familiar to them. But it is extremely damaging to relationships. So damaging, that the prevalence of physical violence must be zero. If you are in a partnership, and your partner has in any way physically attacked or assaulted you, the best response is to immediately remove yourself from that relationship, at least until your partner can get help to change the behavior. Research shows that domestic violence doesn’t get better on its own without intervention. If anything, it will get worse. If you are someone who has in any way physically attacked or assaulted a partner, it is essential that you get help and support immediately so that you can change this behavior. If you are in a relationship with mutual violence, you both need to get help to learn to tolerate your triggers and be able to move through them without violence. The SCORE process is a good start, but coaching or counseling will be essential to make a real change.